High-level competition at the Fintech Awards 2018 organised by KPMG in Luxembourg: 200 Fintech taking part of the contest, 15 semi-finalists, 8 finalists, a whole day pitching to convince the jury and 3 winners on stage! 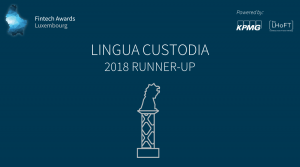 Lingua Custodia ranked 2nd with its innovative solutions for automated translation specialised in the financial domain. Proud of our team and recognition of our expertise in Artificial Intelligence! !